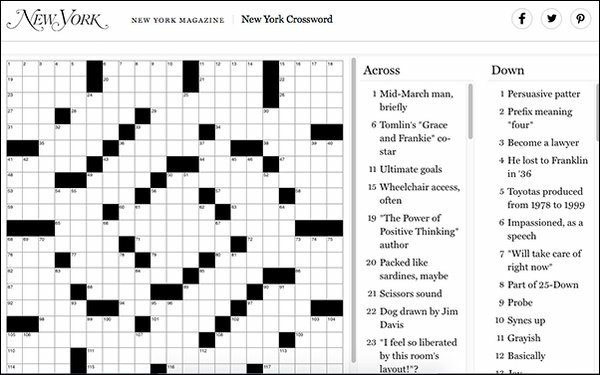 This week New York magazine debuts a new digital crossword feature with the publication of its March 4-17 issue. Available on the publication’s website across desktop and mobile devices, the crossword will be exempt from New York’s digital subscription package and will post every Sunday night. A new puzzle will post every two weeks with each new issue of New York. A puzzle from the archives appears on alternate weeks. The puzzle, whose first appearance was curated by Stephen Sondheim at New York’s launch, is written by Matt Gaffney. Earlier this year, The New York Times revealed it had added 172,000 new subscriptions derived from it’s own digital Crossword and Cooking products. According to New York, a collection of 50 of Cathy Allis’ New York crosswords will also be published in June by Simon & Shuster. Upcoming authors include Polly Rosenwaike and Xuan Juliana Wang. Future installments will include both original pieces and book excerpts. The new feature comes as the Cu tand its sister sites, like Vulture, expand their book coverage. Last fall, New York Media announced it would triple its books coverage across both sites and others, including Daily Intelligencer, the Strategist, and Grub Street, as well as New York.